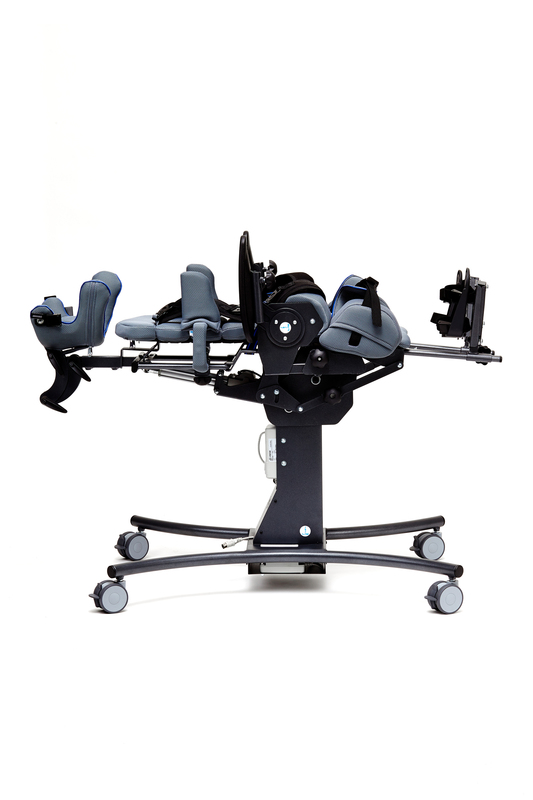 The multi functional standing frame Baffin Automatic is designed to set the patient in multiple sitting positions or the standing position. It is available in 3 sizes: S, M, L for children between 85cm and 130cm (2’8” – 4’3”) tall. The innovative system of built-in spine, side supports and pelvis correction, makes Baffin Automatic an excellent tool for physiotherapists. 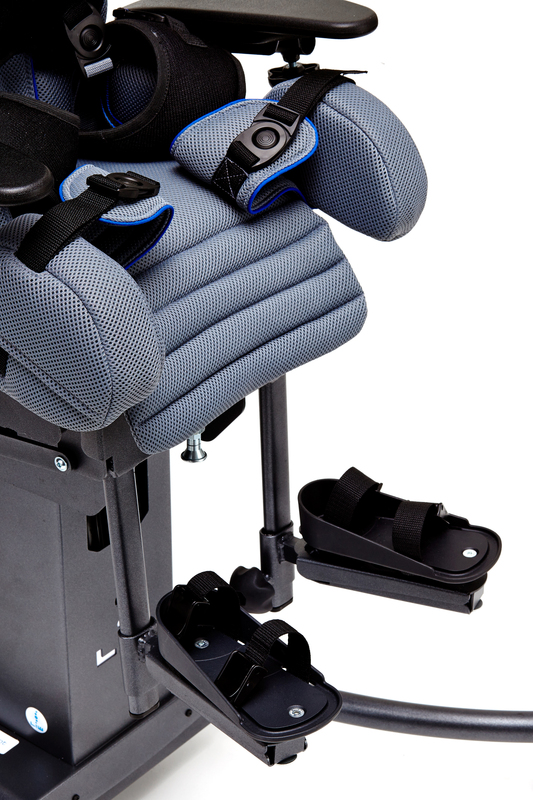 It simplifies the change of the patient’s position for standing to sitting. 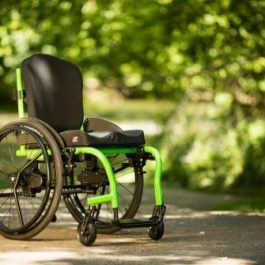 Thanks to its simplicity, it can be used at rehabilitation centres and at home to continue the therapy. 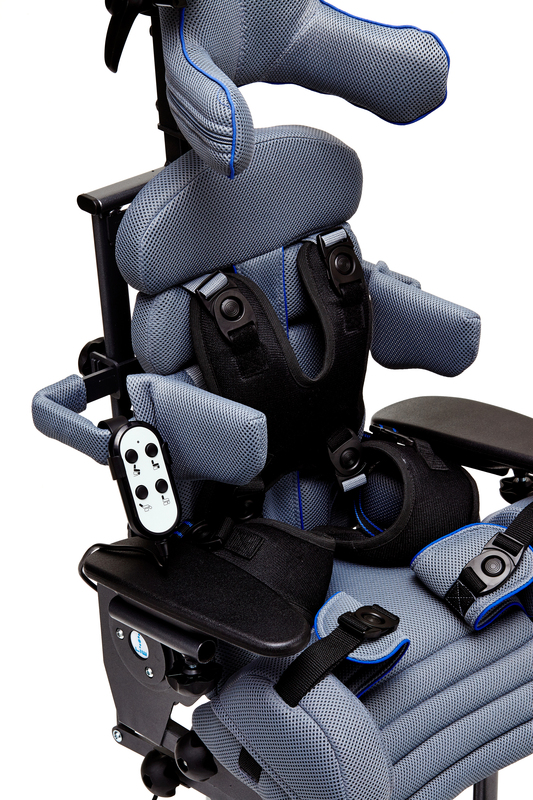 The device can be used to get the patient into a standing position, or stabilise them in sitting and lying positions, as well as for transport. Thanks to the innovative system of built-in spine, side supports and pelvis correction, Baffin automatic is an excellent tool for physiotherapists, which simplifies getting the patient into standing or sitting positions. Spinal support along the whole back line helps to reduce pressure on a single vertebra, while multi-positioning enables the change of an axial tension vector. Thanks to the our remote control system, reaching a standing position is easy and does not require carer’s force. 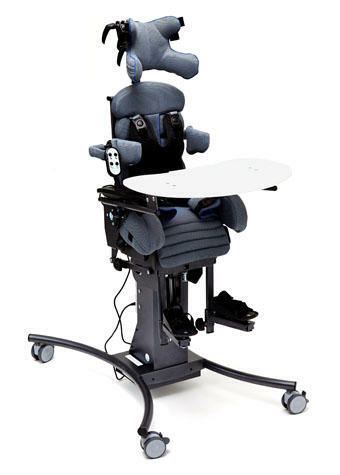 During the day, the patient remains in the device, since the upright standing function is available on demand. There is no need to take the patient out of the device, because it is possible to carry out a few-minute upright standing cycles, combined with resting in a sitting position. Thanks to this solution, the frequency of performing operations may be increased and a patient is upright more often, which positively influences their general health state. Baffin Automatic enables establishing a correct sitting pattern. The patient equipped with the device may take part in educational activities, occupational therapy and in play. The device helps to activate the patient and develop cognitive functions. An important feature is that Baffin ’grows’ with its user — it ensures long usage without the need to change the device. 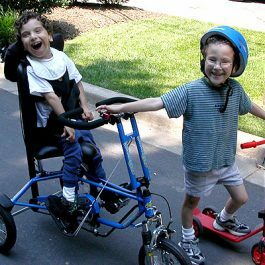 cerebral palsy, muscular dystrophies, paralyses of various etiology, spina bifida, myelomeningocele,, condition after a spinal injury, condition after a craniocerebral trauma, condition after strokes, faulty postures, particularly scoliosis, when different treatment cannot be used. Thanks to its structure, Baffin Automatic device makes it possible to put upright patients with fixed contractures of a hip and a knee joint, however, such cases must be analysed individually. 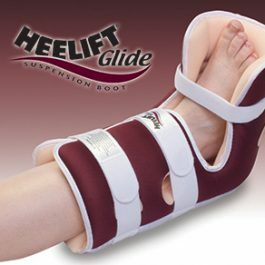 Heelift effectively eliminates pressure from the heel by offloading all pressure from the heel and redistributing the pressure to the calf, preventing the development of heel pressure ulcers. A gentle cradling and cushioning of the lower leg with the heel elevated in protective space reduces the chances for irritation or pressure points. The Heelift Glide has a soft, smooth exterior fabric allows the patient’s leg to “glide” from side to side, thereby preventing it from catching on sheets and blankets. That means: the foot stays in the proper position in the offloading boot; less nursing time is needed to reposition the patient; and heel pressure ulcer prevention is maximized. Available in standard, petite, and bariatric sizes (sizing chart in gallery). For bulk orders please contact us to discuss bulk pricing. Now in Mini, Small, Medium and Large. 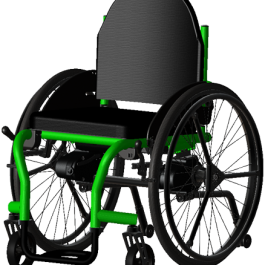 Meywalk® 4 stands out in the market of assistive technology by being spring suspended. create a platform for further development. 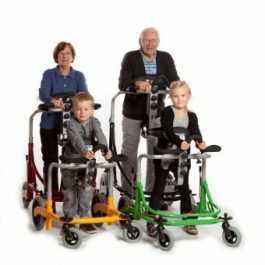 As known from the previous Meywalk® models entering and exiting Meywalk® 4 is quite easily done by way of the built-in swing bar that lowers and raises the seat and trunk support when the assisted user enters or exits the walker. TheTool-free adjustments Meywalk® 4 is available in four sizes and can be adjusted to fit the needs and size of each individual user. All settings are done easily without the use of tools, which is a great advantage during active and busy days. 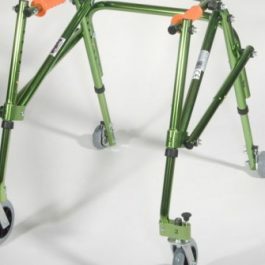 Most surfaces on the walker are either coated or upholstered with closed-surface polyurethane that ensure longevity, easy maintenance and cleaning. 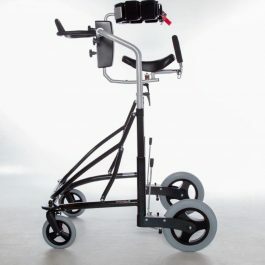 Meywalk® 4 comes standard with dynamic saddle seat and rear stop, handle bar, trunk support in the required size, parking- and drag brakes, non-reverse function, front wheel swivel locks and springs that match the user’s body weight.The trunk support for Meywalk® 4 is available in five sizes. This product is primarily for indoor use but very suitable for outdoor use on hard and flat surfaces. We always recommend that the user is supervised by outdoor use.